This was published as a Wall Street Journal Think Tank column on February 4, 2016. Listening to the political debate about health care, and in conversations with patients and health professionals across the country, I get the sense that some people that feel their choice of doctors–and hospitals–is threatened and that people are losing their regular doctors as insurers narrow provider networks to lower costs. Critics have blamed the Affordable Care Act; in a recent campaign rally in Iowa, Sen. Ted Cruz charged that Obamacare is “taking our doctors.” Data from the Kaiser Family Foundation’s January health-tracking poll, however, indicate that this problem is smaller than conventional wisdom and critics have suggested. It can, of course, be a problem if people are losing their doctor through the narrowing of networks, even if the overall number of such instances is relatively small. If, for example, cancer patients feel forced to leave their longtime oncologist because they are no longer in the plan’s network, that can be a source of serious concern and stress, and it doesn’t take a lot of such cases to warrant government attention. Yet it’s not always the case that people want unlimited choice of providers; some are more willing to trade broad choice of providers for lower premiums and out-of-pocket costs when they do not have established medical relationships or when their finances are strained. Erosion of provider choice and narrow networks may be more pronounced in certain sectors of the health-care system. Some plans in the ACA marketplaces have sought to keep premiums down by narrowing provider networks, as have some Medicaid managed-care plans. 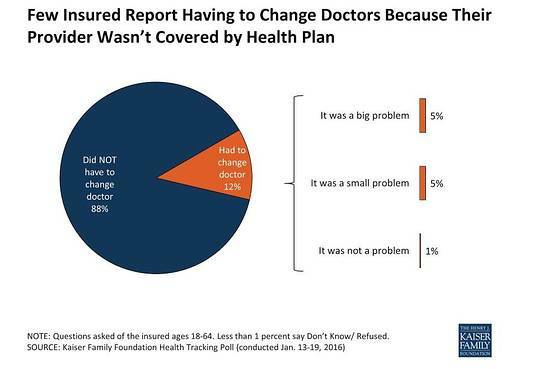 Kaiser polling has found that people value no feature of their health insurance plans more than their ability to see the doctors they want without paying more. The fact that doctor choice has not been widely compromised to date does not mean that the public would stand for broad restrictions on choice in the future. Choice of doctor and especially the ability to keep your doctor if you have one remain a third rail in U.S. health care for anyone proposing reforms.